How much is being born into a certain part of the income distribution correlated with where you end up in the income distribution as an adult? Leila Bengali and Mary Daly offer some striking figures in "U.S. Economic Mobility: The Dream and the Data," written as the Federal Reserve Bank of San Francisco Economic Letter for March 4. The best way to compare life outcomes across generations is a disputed topic, and Bengali and Daly tackle it this way. They use data from the Panel Study of Income Dynamics, which is a "longitudinal" survey: that is, it started off in 1968 with a sample of 5,000 families and has tracked those families, and their children, over the decades. As they write: "Specifically, we adjust family income for inflation and family size, and compare families with fathers age 36 to 40 with those of their children when they reached the same age bracket." This measure of family income includes both taxable income and transfer payments. In this figure, the horizontal axis shows "Birth income quintile," that is, if you divide the income distribution into fifths, or "quintiles," where were children born. "For each birth quintile, five bars describe the distribution of income rank as adults. For example, for all those born into the bottom quintile, 44% are still in that quintile as adults. About half as many, 22%, rise to the second quintile by adulthood. The percentages go down from there. ... 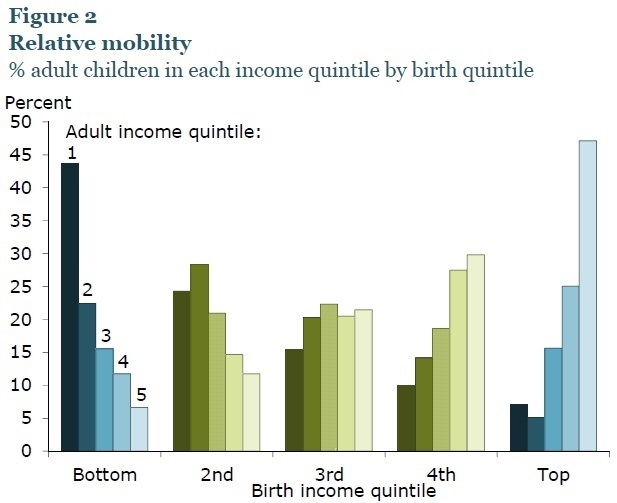 Similarly, those born into the top income quintile are relatively likely to remain in the top. Among children born into the top quintile, 47% are still there as adults. Only 7% fall to the bottom quintile. The experiences of those born into the middle three quintiles are quite different. The distribution among income quintiles as adults is much more even for those born in these three middle groups, suggesting significant mobility for these individuals. ... This pattern has led researchers to conclude that the U.S. income distribution has a fairly mobile middle, but considerable “stickiness at the ends” ..."
What about if we bring education into the picture? Again, start with birth income quintile, but now just look the bottom quintile--no college or college--and the top quintile--no college or college. "For example, only 5% of children born into the bottom quintile who don’t graduate from college end up in the top quintile. 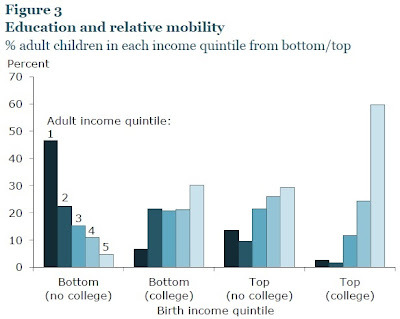 By contrast, 30% of bottom-quintile children who graduate rise to the top quintile. 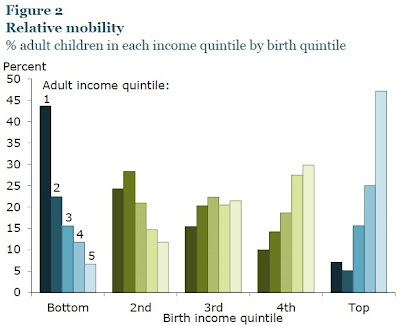 The pattern is different for children born into the top quintile. Most stay in or near the top quintile regardless of whether they graduated from college. Still, the tendency to stay at the top is much more pronounced for those with a college degree. The distributions among income quintiles are similar for children born to parents in the bottom quintile who complete college and for children born into the top quintile who do not get a degree. This suggests that a child born to a bottom quintile family who graduates from college has similar mobility to a child born to a top quintile family who does not finish college. ... However, it’s important to note that access to college is not equal across income distribution. Over half of children born into the top quintile graduate from college. By contrast, only 7% of those born to parents in the bottom quintile get a college degree. ... This indicates that birth circumstances contribute to the stickiness at the top and bottom of income distribution, either directly or through differential access to education." First, the appropriate level of mobility across the income distribution is a difficult question upon which to be honest. Most parents I know are more in favor of economic mobility in the abstract than in the particular case of their own children. In the abstract, sure, it's easy to argue that every child should have an equal opportunity for their efforts and abilities to take them to the top of the income distribution. But it's a hard mathematical fact that not everyone will end up at the top; indeed, half of all students will inevitably fall below the median. 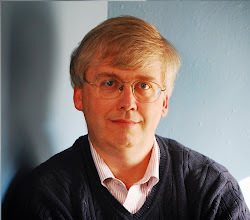 It's a little less comfortable to argue that every child should have an equal opportunity for their efforts and talents to land them in the middle of the income distribution; and it's downright uncomfortable to argue that every child should have an equal opportunity for their talents and efforts to land them at the bottom of the income distribution. As parents, my wife and I make a considerable effort to assure that the opportunities for the efforts and talents of our own children will be above-average. Second, for the record, the original idea of the "American dream" as discussed by the Pulitzer prize-winning historian James Truslow Adams in his 1931 book The Epic of America wasn't just about economic mobility, but was also about social equality and the greater freedom that Americans had to to choose their own personal path than did European societies that were more bound by class and social expectations. For my post from back in July 2011 on this subject, see here.